The Depression also resulted in an increase of emigration for the first time in American history. Some immigrants went back to their native countries, and some native U.S. citizens went to Canada, Australia and South Africa. There were mass migrations of people from badly hit areas in the Great Plains (the Okies) and the South to places such as California and the cities of the North (the Great Migration). Racial tensions also increased during this time. By the 1940s immigration had returned to normal, and emigration declined. A well-known example of an emigrant was Frank McCourt, who went to Ireland, as recounted in his book Angela's Ashes. Many banks began to fail in October 1930 when farmers defaulted on loans. There was no federal deposit insurance during that time as bank failures were considered a normal part of economic life. Worried depositors started to withdraw savings, so the money multiplier worked in reverse. Banks were forced to liquidate assets (such as calling in loans rather than creating new loans). This caused the money supply to shrink and the economy to contract (the Great Contraction), resulting in a significant decline in aggregate investment. The decreased money supply further aggravated price deflation, putting more pressure on already struggling businesses. A large contribution to the recession was the closure and suspension of thousands of banks across the country. Financial institutions failed for several reasons, including unregulated lending procedures, confidence in the Gold standard, consumer confidence in future economics, and agricultural defaults on outstanding loans. With these compounding issues the banking system struggled to keep up with the public's increasing demand for cash withdrawals. This overall decreased the money supply and forced the banks to result to short sale (real estate) and liquidation of existing loans. In the race to liquidate assets the banking system began to fail on a wide scale. In November 1930 the first major banking crisis began with over 800 banks closing their doors by January 1931. By October 1931 over 2100 banks were suspended with the highest suspension rate recorded in the St. Louis Federal Reserve District, with 2 out of every 5 banks suspended. The economy as a whole experienced a massive reduction in banking footholds across the country amounting to more than nine thousand closed banks by 1933. The closures resulted in a massive withdrawal of deposits by millions of Americans estimated at near $6.8 billion (equivalent to around $60 billion in today's dollars). During this time the Federal Deposit Insurance Corporation (FDIC) was not in place resulting in a loss of roughly $1.36 billion (or 20%) of the total $6.8 billion accounted for within the failed banks. These losses came directly from everyday individuals' savings, investments and bank accounts. As a result, GDP fell from the high seven-hundreds in 1929 to the low to mid six-hundreds in 1933 before seeing any recovery for the first time in nearly 4 years. Federal leadership intervention is highly debated on its effectiveness and overall participation. The Federal Reserve Act could not effectively tackle the banking crisis as state bank and trust companies were not compelled to be a member, paper eligible discount member banks heavily restricted access to the Federal Reserve, power between the twelve Federal Reserve banks was decentralized and federal level leadership was ineffective, inexperienced, and weak. The unregulated growth of small rural banking institutions can be partially attributed to the rising cost of agriculture especially in the Corn Belt and Cotton Belt. Throughout the corn and cotton belts real estate increases drove the demand for more local funding to continue to supply rising agricultural economics. The rural banking structures would supply the needed capital to meet the farm commodity market, however, this came with a price of reliability and low risk lending. Economic growth was promising from 1887 to 1920 with an average of 6 percent growth in [GDP]. In particular the participation in World War I drove a booming agricultural market that drove optimism at the consumer and lending level which, in turn, resulted in a more lax approach in the lending process. Overbanked conditions existed which pressured struggling banks to increase their services (specifically to the agricultural customers) without any additional regulatory oversight or qualifications. This dilemma introduced several high risk and marginal business returns to the banking market. Banking growth would continue through the first two decades well outside of previous trends disregarding the current economic and population standards. Banking profitability and loan standards begin to deteriorate as early as 1900 as a result. Crop failures beginning in 1921 began to impact this poorly regulated system, the expansion areas of corn and cotton suffered the largest due to the dust bowl era resulting in real estate value reductions. In addition, the year 1921 was the peak for banking expansion with roughly 31,000 banks in activity, however, with the failures at the agricultural level 505 banks would close between 1921 -1930 marking the largest banking system failure on record. Regulatory questions began to hit the debating table around banking qualifications as a result; discussions would continue into the [Great Depression] as not only were banks failing but some would disappear altogether with no rhyme or reason. The panic of financial crisis would increase in the Great Depression due to the lack of confidence in the regulatory and recovery displayed during the 1920s, this ultimately drove a nation of doubts, uneasiness, and lack of consumer confidence in the banking system. Whether this caused the Great Depression is still heavily debated due to many other attributing factors. However, it is evident that the banking system suffered massive reductions across the country due to the lack of consumer confidence. As withdraw requests would exceed cash availability banks began conducting steed discount sales such as fire sales and short sales. Due to the inability to immediately determine current value worth these fire sales and short sales would result in massive losses when recuperating any possible revenue for outstanding and defaulted loans. This would allow healthy banks to take advantage of the struggling units forcing additional losses resulting in banks not being able to deliver on depositor demands and creating a failing cycle that would become wide spread. Investment would continue to stay low through the next half decade as the private sector would horde savings due to uncertainty of the future. The federal government would run additional policy changes such as the Check tax, monetary restrictions (including reduction of money supply by burning), High Wage Policy, and the New Deal through the Hoover and Roosevelt administration. Unemployment reached 25 percent in the worst days of 1932-33, but it was unevenly distributed. 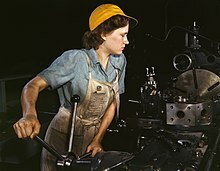 Job losses were less severe among women, workers in nondurable industries (such as food and clothing), services and sales workers, and those employed by the government. Unskilled inner city men had much higher unemployment rates. Age also played a factor. Young people had a hard time getting their first job. Men over the age of 45, if they lost their job, would rarely find another one because employers had their choice of younger men. Millions were hired in the Great Depression, but men with weaker credentials were not, and they fell into a long-term unemployment trap. The migration in the 1920s that brought millions of farmers and townspeople to the bigger cities suddenly reversed itself. Unemployment made the cities unattractive, and the network of kinfolk and more ample food supplies made it wise for many to go back. City governments in 1930–31 tried to meet the depression by expanding public works projects, as President Herbert Hoover strongly encouraged. However, tax revenues were plunging, and the cities as well as private relief agencies were totally overwhelmed by 1931; no one was able to provide significant additional relief. People fell back on the cheapest possible relief, including soup kitchens providing free meals to anyone who showed up. After 1933, new sales taxes and infusions of federal money helped relieve the fiscal distress of the cities, but the budgets did not fully recover until 1941. In France, the " Popular Front" government of Socialists with some Communist support, was in power 1936–1938. It launched major programs favoring labor and the working class, but engendered stiff opposition. The stock market crash in the 1929 not only affected the business community and the public's economic confidence, but also it led to the banking system soon after the turmoil. The boom of the US economy in the 1920s was based on high indebtedness, and the rupture of the debt chain caused by the collapse of the bank had produced widespread and far-reaching adverse effects. It is precisely because of the shaky banking system, the United States was using monetary policy to save the economy that had been severely constrained. The American economist Kindleberger of long-term studying of the Great Depression pointed out that in the 1929, before and after the collapse of the stock market, the Fed lowered interest rates, tried to expand the money supply and eased the financial market tensions for several times, however they were not successful, the fundamental reason was that the relationship between various credit institutions and the community was in a drastic adjustment process, the normal supply channels for money supply were blocked. Later, some economists argued that the Fed should do a large-scale opening market business at that time, but the essence of the statement was that the US government should be quick to implement measures to expand fiscal spending and fiscal deficits, whereas, the essence of this argument was that the US government should be promptly implemented to expand the fiscal spending and the fiscal deficits measures. In terms of the financial reform, since the recession, Hoover had been trying to repair the economy. He founded government agencies to encourage labor harmony and support local public works aid which promoted cooperation of government and business, stabilize prices, and strive to balance the budget. His work focused on indirect relief from individual countries and the private sector, which was reflected in the letter emphasizing "more effective supporting for each national committee" and volunteer service -" appealing for funding" from outside the government. The commitment to maintain the gold standard system prevented the Federal Reserve expanded its money supply operations in 1930 and 1931, and it promoted Hoover's destructive balancing budgetary action to avoid the gold standard system overwhelming the dollar. As the Great Depression became worse, the call raised for increasing in federal intervention and spending. But Hoover refused to allow the federal government to force fixed prices, control the value of the business or manipulate the currency, in contrast, he started to control the dollar price. For official dollar prices, he expanded the credit base through free market operations in federal reserve system to ensure the domestic value of the dollar. He also tended to provide indirect aid to banks or local public works projects, refused to use federal funds to give aid to citizens directly, which will reduce public morale. Instead, he focused on volunteering to raise money. Even though Hoover was a philanthropist before becoming president, his opponents regarded him as not responsible for the citizens. During the administration of Hoover, the US economic policies had moved to activism and interventionism. 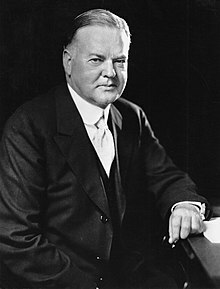 In his re-election campaign, Hoover tried to persuade the Americans to claim that the measures they requested seemed to be helpful in the short term, but it would be devastating in the long run. Eventually, he was defeated by Franklin Roosevelt in 1932. At the beginning of 1933, the last few weeks of Hoover's term, the American financial system was paralyzed. The Great Depression was extended by the interventionist policy for four years. Bank crisis caused the serious deflationary pressures. For this phenomenon, Hoover still wanted to stop it. In fact, the worst period of 1932 – the Great Depression had passed, but the recovery was slow and weak. During the financial crisis of 1933 that culminated in the banking holiday in March 1933, a lot of gold flowed out from the Fed, some of them flow out to individuals and companies in the United States. This domestic loss occurred because individuals and businesses like to deposit metal gold into bank deposits or banknotes, some gold flows to foreign countries, and this external loss occurred because foreign investors were worried about the depreciation of the dollar. Roosevelt understands that the traditional political and financial policy cannot save the United States from the "disaster years", he pursued the " New Deal" to attempt to make up for the United States by administrative means. 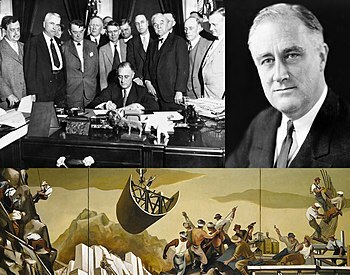 In the spring and summer of 1933, the Roosevelt government suspended the gold standard. The Emergency Banking Act gave the President the power to control international and domestic gold sports. It also gave the treasury secretary the power to surrender of gold coins and certificates. On April 20, President Roosevelt issued a formal announcement of the moratorium on the gold standard. The announcement prohibited gold exports, and prohibited financial institutions from converting money and deposits into gold coins and ingots. The action prevented the gold outflow. Soon, the Roosevelt government weakened the connection with gold once again. Thomas amendment to the Agricultural Relief Act to the gave to the President power to reduce the dollar's gold content by as much as 50%. The President Roosevelt also used the silver standard instead of gold to exchange dollars, it determined by the price of the bank. In April 1933, Roosevelt decided to abolish the gold standard through the New Deal. He abandoned this traditional monetary policy is mainly due to the big crisis to the original monetary policy failure. And the purpose of his action is to prohibit all exports of gold except for foreign countries, so that the United States can maintain an equal monetary base with the vast majority of countries. The Hoover government stubbornly insisted on using the "sound money" policy who against deficit spending and state relief that only make the economic crisis worsen. Because of this situation Roosevelt forced the implementation of inflation, and used the federal deficit spending to promote employment to enforce relief. The abandon of the gold standard made the Wall Street stock prices quickly increased, Wall Street's stock trading was exceptionally active, with a total of 5 million shares delivered on a day, which is the most active day in the past six months. The Hoover Administration attempted to correct the economic situation quickly, but was unsuccessful. Throughout Hoover's presidency, businesses were encouraged to keep wage rates high. President Hoover and many academics believed that high wage rates would maintain a steady level of purchasing power, keeping the economy turning. In December 1929, after the beginning phases of the depression had begun, President Hoover continued to promote high wages. It wasn't until 1931 that business owners began reducing wages in order to stay afloat. Later that year, The Hoover Administration created the Check Tax  to generate extra government funding. The tax added a two cent tax to the purchase of all bank checks, directly affecting the common person. This additional cost pushed people away from using checks, so instead the majority of the population increased their usage of cash. Banks had already closed due to cash shortage, but this reaction to the Check Tax rapidly increased the pace. In the "First New Deal" of 1933–34, a wide variety of programs were targeted toward the depression and agriculture in rural areas, in the banking industry, and for the economy as a whole. Relief programs were set up for the long-term unemployed who are routinely passed over whenever new jobs did open up. The most popular program was the Civilian Conservation Corps that put young men to work in construction jobs, especially in rural areas. Prohibition was repealed, fulfilling a campaign pledge and generating new tax revenues for local and state government. A series of relief programs were designed to provide jobs, in cooperation with local governments. The National Recovery Administration (NRA) sought to stimulate demand and provide work and relief through increased government spending. To end deflation the gold standard was suspended and a series of panels comprising business leaders in each industry set regulations which ended what was called "cut-throat competition," believed to be responsible for forcing down prices and profits nationwide. Several Hoover agencies were continued, most notably the Reconstruction Finance Corporation, which provided large-scale financial aid to banks, railroads, and other agencies. Reforms that had never been enacted in the 1920s now took center stage, such as the Tennessee Valley Authority (TVA) designed to electrify and modernize a very poor, mountainous region in Appalachia. By 1936, all the main economic indicators had regained the levels of the late 1920s, except for unemployment, which remained high. In 1937, the American economy unexpectedly fell, lasting through most of 1938. Production declined sharply, as did profits and employment. Unemployment jumped from 14.3% in 1937 to 19.0% in 1938. A contributing factor to the Recession of 1937 was a tightening of monetary policy by the Federal Reserve. The Federal Reserve doubled reserve requirements between August 1936 and May 1937  leading to a contraction in the money supply. ^ "Banking Panics (1930–1933)." Encyclopedia of the Great Depression. Encyclopedia.com. 13 Jun. 2017< http://www.encyclopedia.com>. ^ Gressley, Gene M. (1964). "Thurman Arnold, Antitrust, and the New Deal". The Business History Review. 38 (2): 214–231. doi: 10.2307/3112073. JSTOR 3112073. ^ Roose, Kenneth D. (1948). "The Recession of 1937-38". Journal of Political Economy. 56 (3): 239–248. doi: 10.1086/256675. JSTOR 1825772. ^ Higgs, Robert (March 1992). "Wartime Prosperity? A Reassessment of the U.S. Economy in the 1940s". Journal of Economic History. 52 (1): 41–60. doi: 10.1017/S0022050700010251. "Banking Panics (1930–1933)." Encyclopedia of the Great Depression. Encyclopedia.com. 13 Jun. 2017< http://www.encyclopedia.com>.